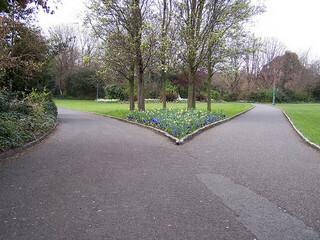 The “fork in the road” is the place where one road branches into two. We use the metaphor to describe those times when we must make a decision in life. Naturally, there are both major and minor decisions in life. The minor ones occur daily and are still important, for if we choose wrongly in the so called minor, on a daily basis, they will eventually have a major impact. I launched this series from that bedrock of a passage, in Second Corinthians 10: 4 – 5, in which we are told to “bring thoughts into captivity to the obedience of Christ.” The end goal is not simply positive thinking, but obedience to Christ. We were predestined to be “conformed” into His image. (Romans 8:29) We are cautioned about being conformed to the pattern of this earthly world and the way to avoid that is by the renewing of the mind. (Romans 12:2) But the end game is all about obedience. A renewed mind is better able to discern the will of God, that one might act upon that will and make choices that glorify God. The universal downfall of man can be attributed to the fact that they “exchanged the truth of God for a lie, and worshiped and served the creature rather than the Creator.” (Romans 1:25) The antidote to this dilemma is to reverse course or take the other fork, namely – to exchange the lie for the truth of God. The Spirit of truth stands ready to guide me into all truth. (John 16:13) It’s really pretty simple on paper. In real life it gets complicated and messy – this dual exercise of dismantling the negative strongholds and establishing a positive fortress of God’s Word to occupy my mind. Negative thoughts become actions, which become habits, which become a stronghold. Thinking on God’s Word becomes positive action, which becomes godly habit, which becomes a fortress called the mind of Christ. The ultimate “fork in the road” in my opinion, is found in Deuteronomy 11:26 – 28. “I’ve brought you today to the crossroads of Blessing and Curse. The Blessing: if you listen obediently to the commands of God… The Curse: if you don’t pay attention to the commands of God… (The Message Bible) The word “curse” doesn’t garner much usage in our vocabulary, but everyone understands what the “blessing” is and what it looks and feels like to be blessed. I love the illustration of being blessed, from this passage: “Blessed is the man whose strength is in You, whose heart is set on pilgrimage. As they pass through the valley of Baca (weeping) they make it a spring. The rain also covers it will pools (blessings). They go from strength to strength; each one appears before God in Zion.” The Hebrew word for blessing is translated here as “pools.” We desperately need to think like pilgrims. We choose to find a resource in God, no matter what our circumstance or trial. We are not exempt from the valleys of life but we have the daily choice to make them springs. My bottom line is obedience to Christ, just like His bottom line was obedience to the Father. It’s all about the Man who first loved me and became “obedient unto death” for my sake. I have chosen to love Him with my whole heart, soul, mind and strength. That’s my daily choice. That’s how I choose to think. Every thought that seeks to build a contrary agenda in my mind, will be brought, by God’s grace, into captivity to the obedience of Christ.